Special designed profile of workout earbuds fits snugly into your ear canals. 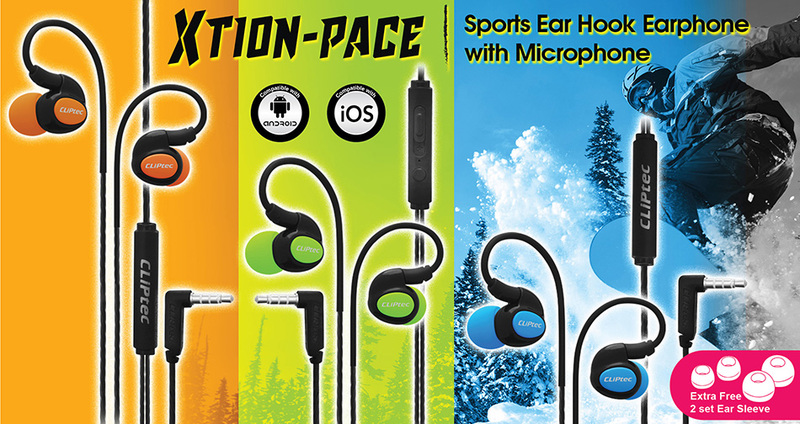 All makes these sport earphone won't fall out of ears during most active sports. 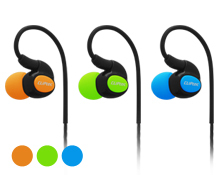 Great sports earbuds for running, jogging, gym, working out, exercising, walking and dancing. Optimized nozzle angle is designed to ensure comfortable wearing in the ears. These exercise earbuds are 12.8g lightweight with soft wire wrapped around the ears. They are comfortable fit even after long-time workout. You can even wear these earphones to sleep in and don't notice much they are in your ears. The cable wires offer high quality audio signal transmission which ensures outstanding sound quality. The sound comes out clear, loud and with bass. They are also noise isolating earphones that can block outside noise. You can listen to your music and phone call clearly even in noisy environments like gym, fitness walk, subway/bus commute and flight trip. A phone call control button and mic are built in the cable. The hands-free control unit is standard and convenient to use. You can use it to answer/end a call (one click the button), skip to the next track (duoble click)/previous track (triple click). The enhanced driver delivers extreme bass with high quality powerful sound.